Mr. Himanshu Sharma working as Assistant Divisional Engineer at Belagavi has bagged the National Award for outstanding service from Shri Suresh Prabhu, Hon’ble Minister for Railway. This award was conferred to him by Hon’ble Minister for Railways during the recently held 61st National Railway Week Award function at Bhubaneshwar. 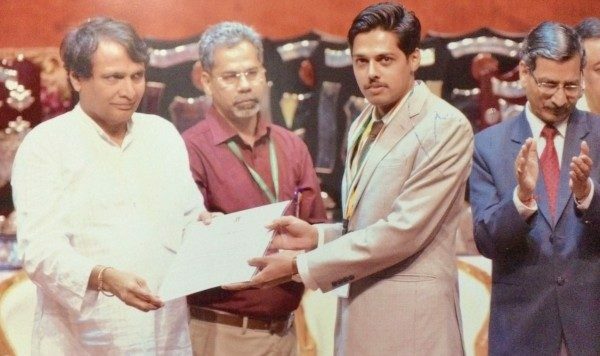 Shri Suresh Prabhu, Honble Minister for Railways (1st from left), giving away the national award for outstanding service to Mr. Himanshu Sharma (3rd from left). Each year, such awards are given to a selected officers and staff of Indian Railway for their outstanding contribution for improvement in safety, punctuality, asset creation, and other such areas during the concluded financial year. Mr. Sharma had been instrumental in elimination of level crossing gates in Londa- Miraj section. Under his active leadership, 12 level crossing gates have been eliminated by construction of Road-Under-Bridges (RUBs), and another 6 unmanned level crossings have been manned for safety of road users. He had an active role in speedy laying of additional track, shifting of yard, and opening of the new station building at Chikkodi Road. He has also significantly improved the quality of track and its maintenance in the Londa- Miraj section. Mr. Himanshu Sharma belongs to the Indian Railway Service of Engineers (2010 Batch). We need you similar leadership in mitigating the wildlife loss happening on the railway tracks cutting through the Belagavi Protected Areas (PA’s) / Forest. Hope to see a quick action on this topic under your leadership.